What is Nose Revision/ Revision Rhinoplasty? ▶ If there is no effect after nose surgery Nose bridge: The current patient's nose shape and thickness of the nose are checked and the appropriate implant is reinserted. Remove all implants and cartilage that were used previously. ▶ If the nose bridge & tip is too high Nose bridge: Depending on the nose condition of the patient, nasal osteotomy may be performed. Reinforcement of the implant that is appropriate for the patient after hump removal. Nose tip: It is the most frequent side effect when using L-shaped silicon. Use autologous cartilage instead of L-shaped silicon for natural nose shape. If the operation is performed with neglect of the asymmetry of the patient or the imbalance of the soft tissue force, the movement of the implant causes the nose to appear distorted. In this case, revision nose surgery has to be done after re-measurement of silicone shape and height appropriate for the patient. In the event of an inflammation of the surgical site, treatment of inflammation or minimization of soft tissue damage is needed. 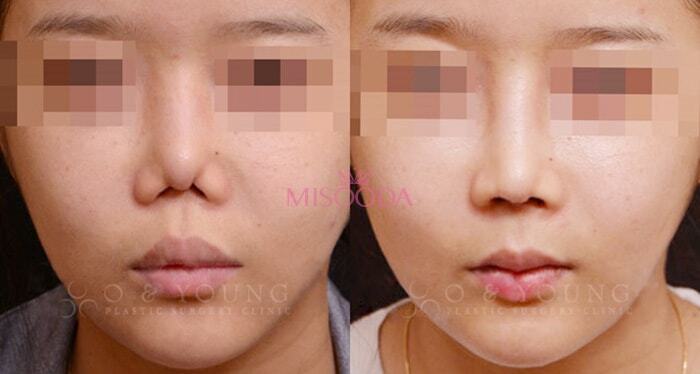 ▶ Nose deformation by capsular contracture If the inflammatory treatment is not initiated early, scarring occurs on the surgical area, then the skin tissue surrounding the silicone is contracted and the nose is lifted. The scar tissues attached should be released and the tip of the nose corrected by using the nasal septum of the nose tip. If the nose reconstruction is severe, additional cartilage may be used (rib cartilage). ▶ In case the nose bridge or nostril is distorted or asymmetrical If the patient is operated ignoring the asymmetry of the nose, the asymmetry may get worse after the surgery. After removing the inserted silicone from the previous surgery, the curved nasal septum and tip are also corrected. If additional correction is needed, osteotomy & implant insertion can be done together. General price guide line for Korean Nose Surgery/ Rhinoplasty is USD$900 to USD$7,500 according to Korea Health Industry Development Institute. The price is decided depending on the method and difficulty of patients’ case. The procedures below can be added on the top of general nose augmentation and the price will be in variable range.